Wow… How’s that for a short review? These pages do something very powerful. They take the reader back in time and into the place that’s being depicted. And that’s as much the art as it is the writing. Or maybe it’s the fact that the writing and the art are such a perfect match for one another that it’s hard to tell where one ends and the other begins because each scene seems to take on a life of its own. If you can’t tell already, I’m a big fan. I will keep this short in terms of commenting on the story, because this first issue is very much a set-up for the events to come, but as far as set-ups go, it tells us everything we need to know to be able to enter the world of these characters and identify the main players. It’s been my impression from reading interviews with Alex Irvine that he did a lot of research for this story, and it shows. The re-imagining of Matt’s origins and adult life, though the reasons for his blindness and heightened senses are not revealed, show an amazing understanding of the era the story is set in. 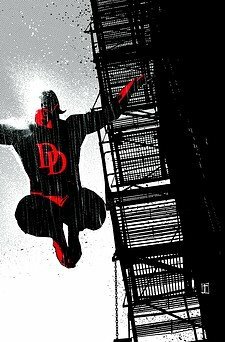 Matt Murdock is not a lawyer in this story, having three strikes against him (being a blind orphan raised in Hell’s Kitchen), which make that kind of success improbable. But he is still teamed with Foggy Nelson, here a low-end private investigator with at least some knowledge of Matt’s extraordinary abilities and extra-curricular activities. Irvine also introduces two villains, the familiar Mr. Fisk and an Orville Halloran, who (if memory serves) was based on an actual Hell’s Kitchen criminal. There is also a damsel in distress in the shape of Halloran’s reluctant girlfriend who is looking for a way out. But is she who she appears to be? That is one of the questions we’re left with as me move forward. Irvine and artist Tomm Coker give us a Hell’s Kitchen which is a little harsher than we’re used to, a little dirtier and a little rainier and where the main character’s morals are perhaps a little more compromised, though appropriately so. The pain, violence and corruption drip from the pages without taking over, and I just can’t wait to revisit Irvine’s and Coker’s Hell’s Kitchen again a month from now. I’m sold. I thought that the cause of Matt’s blindness was Halloran banging his head against the wall in the alley right after shooting Jack? The name Eliza is sort of similar to Elektra, but I guess that’s probably just a superficial similarity or coincidence. Loved the art in this issue. The detail is fabulous (the tin ceiling, the steam locomotive) in giving the period piece exactly the right vibe. Irvine and Coker are doing this series up right! I loved it. I thought the artwork was beautiful and the story engrossing. I’m looking forward to picking up issue #2.